The Copeland station is a feat of structural and electrical engineering, with an overall scope of work that includes building an underground transformer station. Under construction since 2013, the Copeland Station is a feat of structural and electrical engineering, with an overall scope of work that includes building an underground transformer station – only the second such structure in Canada – disassembling and reassembling a historic machine shop, and tunnelling 600 metres from Bremner Boulevard to Front Street to construct a cable tunnel that will connect the new station to the existing electricity grid. The $195-million project is owned by Toronto Hydro, which in 2013, received approval from the Ontario Energy Board to move ahead with the Copeland Station construction project. The project has two general contractors, Dibco Underground, which is managing the tunnel construction portion, and Carillion Construction, which is handling all the structural elements of the station building. The transformer station is named after Clare R. Copeland, who served as the first board chairman of Toronto Hydro for 14 years, from 1999 to 2013. The rationale for the project is two-fold: to have a backup transformer station that can be pressed into use so that obsolete equipment at the Windsor transformer station and others may be replaced; and to address the load growth in the downtown core which by 2019 is expected to reach 95 percent of current capacity, according to Tom Odell, Toronto Hydro’s manager, program support, large projects. “The first and most urgent requirement was to deliver spare capacity to the downtown in order to offload our [five] aging transformer stations that date back to the ‘50s,” said Odell, speaking to CUI about the project this past summer. The other imperative for building the station was a rapidly developing downtown core. According to Toronto Hydro, between 2006 and 2011 Toronto’s downtown population increased by 50 percent. If the load growth continues at that rate, the Windsor transformer station will not be able to service new customers unless more capacity is added. “We have 180 condo buildings either under construction or planned in the near future. Just during the construction of this project, we have seen condominium towers go up around us to the point where Roundhouse Park, where we are located, is almost an oasis in a sea of glass. So those represent a significant increase in load that cannot be met with our existing infrastructure,” Odell said. Once in service, the new transformer station at Bremner Boulevard and Rees Street, across from the Rogers Centre, the CN Tower and Ripley’s Aquarium, will add 144 MVA (megavolt amperes) of capacity – enough to power 70 condominium buildings. A second phase will double the capacity to 288 MVA. Copeland Station will also connect to new infrastructure along Queens Quay, which is being revitalized as part of Waterfront Toronto’s vision for a series of new developments along the waterfront. While above-ground stations used to be the norm in constructing new power transmission infrastructure, the reality of today’s densely populated downtowns, where space comes at a serious premium, has made underground transformer stations an attractive alternative for cities and underground contractors. Japan has several underground transformer stations, and they can also be found in Australia and the United Kingdom, for example. Canada’s first underground station was built in Vancouver, at the corner of Dunsmuir and Richards streets. The station continues to function, undetectable to most residents and commuters, many of whom cross over it every day to and from work. The Copeland Station is the second underground transformer station to be built in Canada. The new station is being built beneath a heritage machine shop, which will be re-assembled once the three-tier underground structure is completed. A significant challenge for the Copeland Station project was finding the space. The south core of Toronto is chock full of condominiums and the Gardiner Expressway takes up a lot of land. There was one building that was not going to be developed, and that was the old CP Rail machine shop, a site of national historical significance. Toronto Hydro came up with the idea of building the transformer station underneath the machine shop, which meant dismantling the shop, storing the parts off site, and then reassembling it upon completion of the station. “It’s smack dab right in the middle of where our loads are. And so the inconvenience, so to speak, of preserving the heritage is also an advantage because it enabled us to use this site,” said Odell. The pick and replace model also worked at the nearby Metro Toronto Convention Centre, which removed half of a heritage locomotive roundhouse in order to build underground parking, then restored the 82-year-old building into the John Street Roundhouse, which now houses the Toronto Railway Museum, Steam Whistle Brewing and Leon’s Furniture. The 50,000-square-foot Copeland Station is being built in stages. The process started by excavating up to 50 feet deep, then installing a caisson wall around the perimeter composed of about 400 concrete pillars burrowed into the ground with a drilling rig. Two tower cranes were used to help place the structural steel and concrete which formed the walls and flooring of the structure. Crews laid down the foundation slab by pouring a mud slab followed by a mat slab. The walls were assembled using columns, concrete and structural steel. Once complete, all major equipment will be installed and connected, including gas-insulated switch gear and transformers, whose compact, non-flammable characteristics are ideal for congested urban environments. Odell noted it is the first time that gas-insulated transformers are being used in Canada. The station was built to withstand seismic events and several flood-prevention measures have been taken, including the shoring wall, a waterproof membrane made of HDPE (high-density polyethylene), waterproof concrete mixes for the exterior walls and flooring, and a redundant sump pump system that operates on emergency power. The new transformer station required a passageway to connect it to the electricity grid, and that is where the other phase of the project came in: tunnelling 600 metres to create a cable tunnel to join the station to the existing cable tunnel running under Front Street. The work began with a construction shaft sunk into the shale bedrock about 30 feet underground, with tunnel boring occurring 110 feet below grade. The first issue the tunnelling contractor was presented with was a construction shaft that was only large enough to accept the tunnel boring machine’s (TBM) cutting head and drive. That meant using a road header to cut out an alcove to enable the TBM to be lowered and assembled in the tunnel. Mining then took place in sections. The main tunnel travels under Bremner Boulevard, veers north up Lower Simcoe Street, and joins up with the existing cable transmission tunnel built by Hydro One – Ontario’s electricity transmission utility. Dibco Underground used an Atlas Copco Jarva MK12 to cut a four-metre outside-diameter tunnel, which housed a concrete liner 3.55 metres in diameter. The hard-rock TBM had to be reversible, since there was no exit point at the confluence of the new and existing tunnels under Front Street. Once the two tunnels met, the TBM was reversed, disassembled and lifted out through the original entry point. While water ingress wasn’t a significant problem for the contractor, they did encounter some issues with fractured shale, which meant having to put in additional supports to shore the tunnel, causing some delay. Another challenge was completing the job within such tight space restrictions. A full-time road closure was required on Rees Street, but there wasn’t enough room to remove the spoils from the TBM without the assistance of overhead cranes. That required more temporary road closures. The entire site was hoarded (fenced) for the duration of each morning rush hour. The 12 cables that feed the transformer station were drawn through a 35-metre radial tunnel, also dug with a road header, and run through the 600-metre large tunnel to end at the Front Street tunnel, where they were connected to the electricity grid. In all, cable pulling took about two months. Commenting on the completion of the tunnelling phase of the operation in June, top brass at Toronto Hydro and Hydro One say the new station will be a key piece of Toronto’s downtown infrastructure. 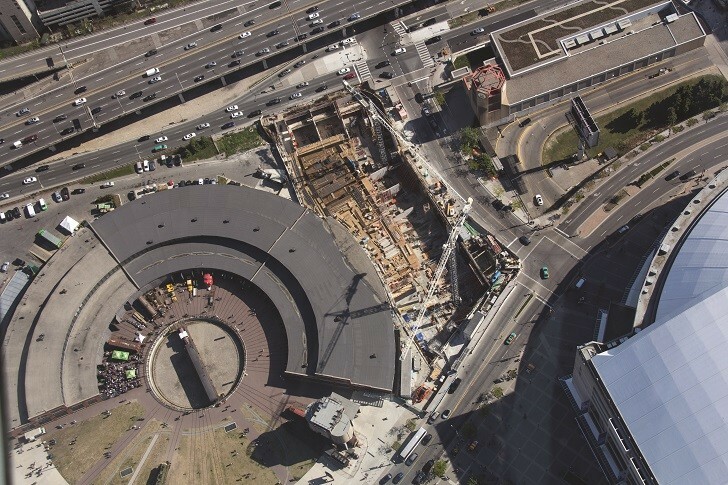 Crews worked approximately three storeys below ground to build the station’s foundation.